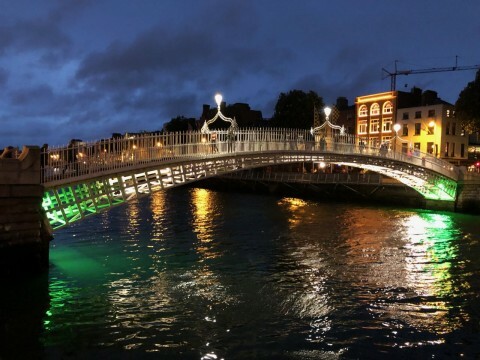 ​Our cruise started in Dublin, the home of Guinness, although most of the crew chose alternative drinks when we eat in the very busy Temple Bar area of the city on Saturday. Three of the crew were staying on from the previous week from Oban so were well settled in to the routine of BB. I had been in Dublin since Wednesday and had heard all about the famine of the 1850s many times during our few days sightseeing, no fear of that as BB settled lower in the water as the shopping was unloaded! So with skipper Paul, mate Matt and crew members Bill and Pascal as well as the previous week's skipper, David, we cast off from Poolbeg marina at 7am on Sunday to head off into a breezy but bright Irish Sea to head south with St Ives as the destination, roughly 200 miles south of us. Watches were started pretty soon but off watch hands were frequently called to help with reefs being put in and shaken out as the wind varied between 15 and 25 knots with gusts to about 30. I've lost count of the sail changes as the conditions changed so often. Mostly it was uneventful with some 'excitement' overnight avoiding ships, but we did see a pod of dolphins in the Bristol Channel, that always perks up a crew. The current as we approached St Ives was stronger than expected which prompted the engine to be fired up so we could anchor before the pubs closed, after 36 hours almost all under sail at very respectable speeds no one objected. St Ives was reached just as daylight left for the day, negotiating the huge number of pot markers/yacht traps in the bay was a real challenge even though they were well marked. The green starboard mark was another matter, it was so tiny and unlit that we didn't see it until the next morning. Being the only boat in the bay that evening gave us a choice of which space between the pot markers to make ours, so the 'hook' was dropped and a very welcome dinner was soon cooking in the galley. With St Ives promising a music festival the tender was readied and Paul, Matt, Pascal and I set off for the old harbour a short distance away, Bill and David preferring to have an early night after the long passage. Landfall for those in the tender came slightly earlier than expected as the engine ran aground in the harbour entrance about 100 yards from the shore. Quickly deploying the oars didn't help much with one being damaged and useless, the spring tide was ebbing so quickly we had to do something soon or we could be stranded The only option was to walk the tender somewhere, but where? As we were all very wet by then we decided to try to get back to BB and found enough water to float the tender and make our retreat! St Ives bay gave us welcome shelter from the strong overnight south westerlies but they continued the next day and the planned trip to the Scillies was abandoned. Staying in St Ives to enjoy the festival was not an option either because the wind was forecast to veer north so the anchorage would be untenable. It was decided that we would to go to Newlyn, just 'round the corner' of Lands End, going inside the TSS but outside Longships lighthouse. Light or not, we didn't see land most of the day as visibility was so poor. But we didn't hear a foghorn either. Newlyn proved an interesting harbour, after being promised that hammerhead on the visitor's pontoon it was occupied when we arrived so we rafted up alongside a big rusty maintenance ship which was outside of an even rustier old fishing boat. Getting ashore meant clambering over huge chains and heavy fishing gear but that didn't discourage a trip into the town to sample 'Proper Job', a local beer and witness the pub's 22 year old cat give some visiting terriers a shock, much like getting back on board did for us…. the tide had gone out a few more metres since we left and we had to climb a long way down a very rusty ladder on the harbour wall to the fishing boat which was about a metre from the wall. No one was lost into the mucky harbour but it was a sobering end to the evening. Leaving Newlyn we had 10 – 16 knot winds for a very pleasant sail around the Lizard peninsular to our overnight destination of the beautiful Helford River. 33 miles later it didn't disappoint and we tied onto one of the visitor buoys in time for a lovely sunset. Next morning the sun shone again, with light winds we set off for Fowey. 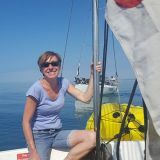 Only 25 miles to sail today so with lightish following winds we experimented with sails, deciding to pole out the genoa. It took a while to free up the pole which looked like it hadn't been used for a while. With 'George' on the helm and the crew focusing on the task on the foredeck we struggled with sheets and poles until we noticed the main, held by the preventer, was backed and BB was sailing backwards, 'George' isn't very good at spotting wind shifts and they caught us out, he certainly can't cope with sailing backwards! Fortunately the wind was only light so the poling out plan was abandoned and a we continued on a beam reach to the pretty town of Fowey, spending the night on a large mid harbour mooring buoy after the harbour master initially put us on one of the many visitors buoys before realising 55 ft was a bit long for them. ​Another meal was eaten on board before we set of for an uneventful tender trip to the pub. Just by the Fowey pontoon are lockers for lifejackets, provided by the RNLI, what a good idea for visiting sailors. After checking out the bakeries for somewhere to collect some Cornish pasties the following morning we settled down for a drink or two in a friendly pub where Pascal ordered a huge pot of the local mussels and felt he was back home. Next day, our last at sea, dawned fine and bright again, we had plenty of time to get to Plymouth so decided to go via the Eddystone rocks, about 12 miles south of Plymouth. With a lightish following wind again it was a chance to fly the cruising chute. It was a learning exercise for most of us, so led by Matt we dragged the huge sail from the locker, doubled it up along the side deck, and after some sorting out of ropes it was filling nicely, giving us a extra knot or two. More dolphins, or maybe they were porpoises, made an appearance on the way. The Eddystone lighthouse, the fourth one to stand on the rocks, was a photo opportunity not to be missed although we couldn't get too close. 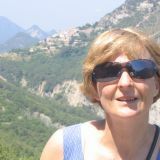 My recipe for a successful Brighton Belle cruise includes: opportunities to develop sailing (and boat handling) skills; practising pilotage / navigation; exploring remote areas – the history, geography, wildlife etc. … all while having fun in a team of like-minded people … and, of course, enjoying fine food! The Oban–Oban cruise had all these ingredients. 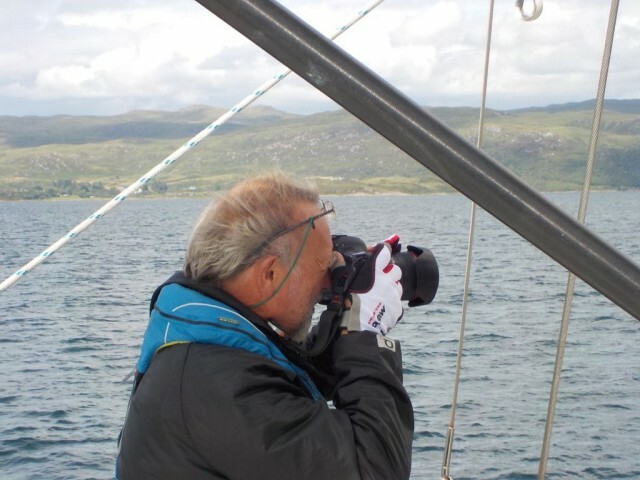 Led by Stuart Ritchie (ex officio Marketing Director Scottish Tourist Board) Chris, Mike, Petra, Phil and Stewart enjoyed a great sailing experience exploring the Jura and Islay region to the south of Oban, assisted by mainly south westerly winds F2–5, occasionally gusting 30 kts. OK, it did rain on a few occasions, but the Scottish mist generates an 'atmospheric' perspective, and the scenery was never constant, being enhanced by the ever changing cloud formations reflecting on the surface of the waters and the splashes of sunlight on the often dramatic mountains. It really was like sailing through an art gallery: quite magnificent. Exposed, as it is, to the Atlantic, this area experiences very strong tides in the gaps (sounds) between the islands calling for accurate navigation: a sailing challenge much assisted by use of the excellent Clyde Cruising Club 'Pilots'. Our exploration was also assisted by Stuart's generous loan of an excellent book describing each Scottish Island in great detail. Hurtling with the flood down the Sound of Islay: 20 degree tacking angles, max. SOG 10.7 knots! 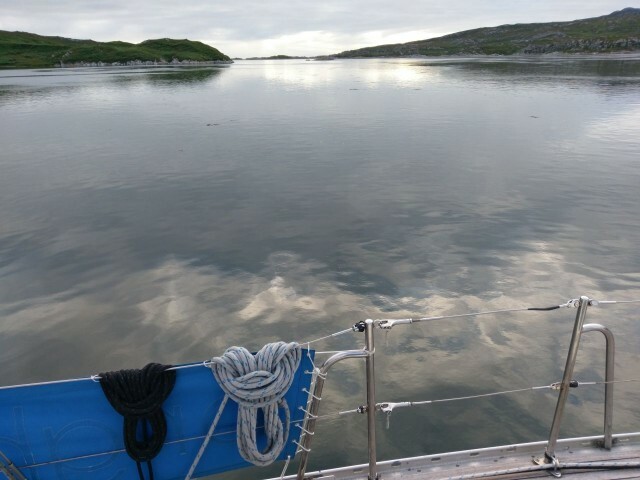 Squeezing through the narrows into a Loch Tarbet anchorage ... and anchoring overnight in the uninhabited Black Isles. Enjoying a drink in the pub on the community-owned island Gigha. Crossing the Gulf of Corryvreckan in the Sound of Jura as the tide changed, with whirlpools galore! Navigating the Cuan Narrows between Seil and Luing –​ very narrow indeed! Visiting the Laphroaig Distillery on Islay, a 1.8 mile walk from an overnight hammerhead berth in Port Ellen. A most enjoyable 'educational' experience, and six 'shot ' glasses have been donated to Brighton Belle! And I haven't mentioned the scallops, the Caol Ila malt or the birds - a constant air display by gannets, kittiwakes, skuas, terns and guillemots. The whole week was a highlight! It was with some sadness that we sailed up the Kerrera Sound back to Oban with SUS Petra (Skipper under Supervision) at the helm to berth in the excellent transit marina. Brighton Belle proudly took her place close to the 'Flying Dutchman' and other tall ships. Indeed, she is (in my opinion) always the finest looking yacht in the marina, and she never fails (in my experience) to provide members of all abilities and interests with a great sailing experience. Thank you team – ​it was a splendid week; and a special thank you to Stuart for your enthusiastic guidance – it's been a brilliant season. In my first trip on Brighton Belle sailing as skipper I prepared two passages one to do an anti-clockwise circumnavigation of Mull in settled weather and one for bad weather in the event of multiple south-westerly fronts coming over. The reality in the words of the Met-Office was "changeable" and with two fronts expected 4 days apart, the around Mull passage was not suitable because of the lack of shelter on the south-west corner of the island. I was not over-disappointed since the totally sheltered anchorages I had found looked extremely attractive from the pilot book, even if they were not strictly required on our week's weather. We had a request from Stewart to see if we could get some good photos on Brighton Belle under sail and that made a nice week's project. Our crew was me, Judith Hankey as skipper, Richard Ash (my husband) as mate, David Roberts (chief photographer), Pascale Labourel, Allan Seagroatt and Robert Kingsbury. Our planned departure from Oban transit marina was with the rising tide on Sunday morning but on the day we could not see Kerrera the island just opposite in the bay. I set the criterion of seeing the island for 30minutes before we left but in fact the visibility never managed that. Google provided the definition of thick fog, which was a visibility of 180m and at times it was that bad as the many low clouds moved over us. At 2pm the crew all agreed to give up on watching the fog and to do other things such as go for various walks. Antares charts worked well on the IPad allowing close quarters real time pilotage through the narrow entrances into our anchorages. The attached screen grab shows our planned waypoints going into Loch Drumbuie, which made it all rather easy. Back up notes and plotter waypoints were available too in case of screen lock-up. The pilot book also has chartlets with plenty of detail to clear the identified shallow patches and rocks.